Qatar, September 6, 2016 - Alstom and HEC Paris in Qatar have signed an agreement to train a group of leaders from Alstom’s Middle East & Africa Region, under a specially designed MEA mid-management (M3) programme. 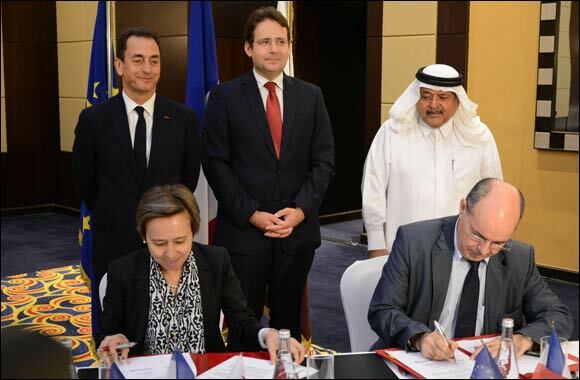 The agreement was signed on the 5th of September during a ceremony in Doha in the presence of HE Matthias Fekl, French Minister of State for Foreign Trade, Promotion of Tourism and French Nationals Abroad and HE Eric Chevallier, Ambassador of France to Qatar. The M3 Programme is a yearly programme co-designed by Alstom and HEC Paris in Qatar to give the selected participants access to HEC Paris’ faculty and learning methods. 25 candidates from South Africa, Egypt, Morocco, Algeria, Turkey, Saudi Arabia, United Arab Emirates, Kazakhstan, and Qatar were chosen for this international programme, which will take place between Doha and Paris over the next eight months. The course is designed to reinforce the exceptional management skills of key talent and increase their capacity to act as change agents. The course is also designed to motivate Alstom’s managers to stay and evolve within the organisation. It aims to help them attain more senior positions in order to support Alstom’s continuous growth in Qatar and the region. “We highly value sustainable growth and, through programmes like these, we encourage continuous improvement within our local talent pool,” says Mrs. Thi Mai Tran, Alstom GCC’s Managing Director. “This programme shows that Alstom is a reliable long-term partner close to its customers, established in the MEA region to accompany countries in their rail development and disciplines” she added. “We are committed to providing and ensuring optimal growth and training opportunities for every employee, from entry-level hires to senior executives” says Jamel Sabeg, HR VP for the MEA region. “Alstom’s determination is second to none, as we proactively partner with educational institutes and provide apprenticeships while continuing to promote rail management professions throughout different regions,” he added. Alstom’s agreement with HEC Paris in Qatar falls in line with Qatar’s National Vision for the year 2030 (QNV 2030), which aims to transform Qatar into a society capable of achieving sustainable development. Human development is prioritised under the QNV 2030, and makes up one of the four main pillars of the country’s strategy for sustainable growth. Needless to say, endorsing the right education for local talent is key to reaching that goal. “We are proud to have partnered with Alstom in offering this custom program in accordance with their training and requirement needs,” Dr. Laoucine Kerbache, Dean & CEO, HEC Paris in Qatar said. “Companies, such as Alstom, are increasingly aware of the importance of such programs as part of their own strategy to impact results. Through strong academic input from our world-class faculty, this program is an enabler to motivate and retain the best talent within the organisation. We look forward to monitor the participants’ progression and success. We hope to extend this initiative to a more comprehensive collaboration in the future.” he added. For over 30 years, Alstom has been part of Qatar’s long and fruitful history of innovative industries. The company has contributed to the advancements of the country’s power and transport developments, and continuously seeks to develop and deliver sustainable solutions for the country’s growing infrastructure. Alstom is currently working on an integrated tramway system for Lusail with the supply of the engineering, procurement, construction, testing and commissioning of 4 tram lines. The contract, which was awarded to Alstom as part of a consortium in June 2014, also includes the supply of catenaryless Citadis trams, power supply, signalling and track works.